Tesla Motors Inc., the electric carmaker backed by Toyota Motor Corp., said cheaper batteries will make its Model S sedan profitable with much lower sales than Nissan Motor Co. is seeking for its Leaf car. The $57,000 electric Model S, which uses cells similar to those in laptops, is designed to make money for Palo Alto, California-based Tesla at 20,000 annual deliveries, Chief Technology Officer J.B. Straubel said in an interview. Nissan Chief Executive Officer Carlos Ghosn has said combined battery- car sales for Nissan and affiliate Renault SA may need to reach 500,000 vehicles a year to be profitable without government aid. Tesla, which has yet to post an annual profit, has delivered $109,000 rechargeable Roadsters since 2008, powered by thousands of small lithium-ion cells similar to those used in portable computers. The Silicon Valley startup says such cells, supplied by Panasonic Corp. and other manufacturers, will remain more cost-effective for the foreseeable future than the larger lithium batteries in the Leaf and General Motors Co.’s $41,000 plug-in Volt, which both went on sale this month. Tesla’s battery packs may cost as little as $200 per kilowatt hour, compared with about $700 to $800 per kilowatt hour for so-called large-form cell lithium-ion packs, Martin Eberhard, a Tesla founder and former chief executive, said in an interview last month. Straubel declined to confirm Eberhard’s estimate or discuss the cost of Tesla’s battery packs. Nissan’s electric vehicle strategy can’t really be compared with that of Tesla, said David Reuter, a spokesman for the Yokohama, Japan-based company’s North American unit. He didn’t elaborate. “The Nissan Leaf product program will be profitable over its lifecycle,” Reuter said. He declined to say how long the product cycle would be for the $32,780 Leaf. The company has been developing its lithium-ion battery technology over the past two decades, “so a lot of the investment has already been amortized through many years,” Reuter said. Nissan fell 1 percent to 777 yen as of the 11 a.m. trading break in Tokyo. The stock has declined 4.1 percent in 2010. 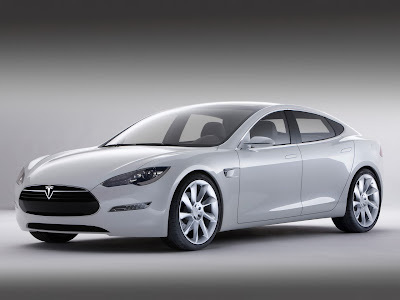 Tesla rose $1.32, or 5 percent, yesterday to $27.73 in Nasdaq Stock Market trading in New York. The shares have surged 63 percent since they began trading on June 28. Tesla’s Straubel conceded the Model S’s higher price will make it easier to turn a profit with fewer deliveries after it goes on sale in 2012. Still, cheaper batteries are the main reason, he said. Tesla’s challenge is to ensure a high level of quality control in its battery pack and assembly processes as it tries to expand from supplying about 1,000 Roadsters a year to making 20,000 or more of the Model S, said Brett Smith, who specializes in alternative propulsion vehicles at the Center for Automotive Research in Ann Arbor, Michigan. As a result, Tesla didn’t have to spend as much for battery research and development and lithium-ion cell production, Smith said. “Especially for a small manufacturer, there’s a logic to what they’re doing,” Smith said.